This amazing evergreen tree has its roots in Australia and Tasmania. Now grown all over the world, there are over 700 species of eucalyptus trees, 500 of which produce essential oils. Eucalyptus is one of three similar genera that are commonly referred to as “eucalypts”, the others being Corymbia and Angophora. Some species are known as gum trees because they exude thick sap from any break in the bark. Scribbly gum is the generic name derived from the Greek words (eu) “well” and (kályptos) “covered”, referring to the operculum or “cap” initially concealing the flowers. Used originally to treat infections and fevers by the Aborigines, its next discovery was by French naturalist, De Labillardiere. Used to treat malaria and fever, this exceptional oil was also used to dry up mucus and help to tonify the lungs. This “fever tree” was planted all over Algiers to “dry up” marshy wetlands infected with malaria breeding, stagnant waters. In fact, the eucalyptus planted in these marsh areas would dry up all the wetlands, converting damp, stagnant marshy areas into dry beds! This aromatic and pungent essential oil works as an expectorant to clear out mucus and deep-rooted phlegm. Therefore, this oil has wonderful antiviral, anticatarrhal and antibacterial properties that make it a “must-have” for any herbal medicine chest! It should be used for sinusitis, the common cold, productive cough, laryngitis and bronchitis. Another benefit of this healing oil is its ability to dry up urogenital disorders such as leucorrhea and cystitis. Dilute in a douche or bathwater for cleansing and clearing out the dampness and infection associated with infectious microbes and discharge. This oil has been used for centuries as a pain analgesic for soothing neuralgia and muscular pain that is worse in damp/cold weather. Psychologically, this incredible essential oil works on freeing our mind. It opens us up to clearer thinking, lifting the heaviness associated with feeling “pinned down” and brings about an “air” of freedom, optimism and positivity. Consider using this oil in an oil burner or diffuser to broaden and open up any room that feels “closed in” or needs “brightening”. This magical oil us also used in incense to “burn away” the trapped emotions or self-contained emotions of fear, insecurity and doubt associated with long term beliefs that no longer serve you. Add some essential oil to a snifter bottle or as a roll on perfume to bring about the awareness of happiness and good fortune in your life! The round leaves of certain species of eucalyptus have been used to propagate and bring a conscious association to money. That is why it is connected to “bringing money to you”. It has sometimes been referred to as a “money tree” or “cash bush” and therefore, is great to have as a part of any empowerment ritual, in a money bag, wallet or purse or used in herbal casting for bringing about change in the financial arena. As you have read, eucalyptus has a long standing reputation in the healing arena, but it is also known as the “herb of protection”. Used for centuries as a guardian growing outside people’s homes to protect them from harm, or planted in gardens to protect them from pesky insects and other damaging visitors, this herb can be used as a wonderful tool for “expanding” your boundaries and moving forward without fear. 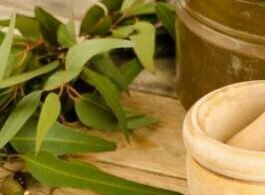 Also eucalyptus leaves have been cast into bonfires, fireplaces and on to candles or incense to help a weak person “cast off evil”. In fact, it is widely believed eucalyptus leaves effectively ward off evil and repel enemies who bring you trouble. So, when you want to dry up a phlegm filled cough or congested sinus, need a rub for pain or achy muscles or need to bring more protection and awareness into your life, consider the magical benefits of this rich and “camphoreous” tool of nature!